A GDC seminar given by Tsutomu Kouno, director or LocoRoco, explored his process and goals in creating that PSP game. Like Miyamoto said earlier that day, Kouno wanted to make people smile. Speaking in Japanese, with us listening to a group of translators over a set of headphones, Kouno began with a personal history. He described growing up making toys, saying he would show them to people to make them laugh. He felt that LocoRoco came from that history. He said, "I wanted to make a game that was easy to play, so that women and children, and people who have never played games before would be interested in playing it. ... I wanted to use AI to make people laugh. That's why I included actions like the LocoRoco stacking up." See our gallery of LocoRoco design slides from the seminar. Kouno also talked about his design process. He watches TV shows -- especially shows about animals and Discovery Channel-style programming -- to adapt real-world ideas into games. And one LocoRoco enemy came from an even closer source. Kouno liked the look of one of his tropical fish and thought it should be in the game. 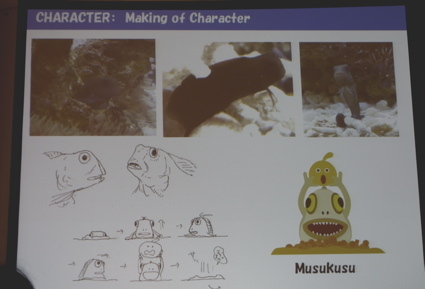 After designing a character in the fish's style, he then decided its purpose from its look; the fish-shaped Musukusu lives underground and pops up to grab LocoRocos. Using a Pocket PC, scraps of paper, and anything else on-hand, Kouno made more notes for the game, drawing landscape shapes, gears, and other ideas. But he quickly moved to the music and its role, wanting the music to change depending on a player's actions. In total, his team recorded about 60 songs for the game to use at different moments, depending on which color LocoRoco is active. While it was difficult to keep up with parts of the talk -- our translation device played constant static, like someone trying to dial a rotary phone -- Kouno came back to the idea of games that make players smile. Kouno's triumph came after a tradeshow in which he saw children play the game, laughing and moving their bodies with the action. And with the PS3's motion-sensitive controller built for this sort of giggling gameplay, Kouno said, "I can't tell you now [about a possible PS3 version]. [But] I'm not going to betray your expectations, so you can count on us."